In 1943 the late Major General Orde C. Wingate led a daring campaign against the Japanese in Burma. He proved that Allied ground troops could operate behind the enemy's lines, cutting off his supply system and upsetting his schedule. General Wingate marched fast and struck hard. The enemy, never knowing where he was going to strike next, was completely thrown off balance. Indeed, this British general's behind-the-lines operation in Burma brought to mind the brilliant cavalry maneuvers of Nathan Bedford Forrest in our own Civil War. Prelude to Wingate's Raid: Bombers Blast Wuntho, Jap Burma Base on the Mandalay-Myitkyina Railroad In March, 1944, the enemy was threatening Allied airfields in India. 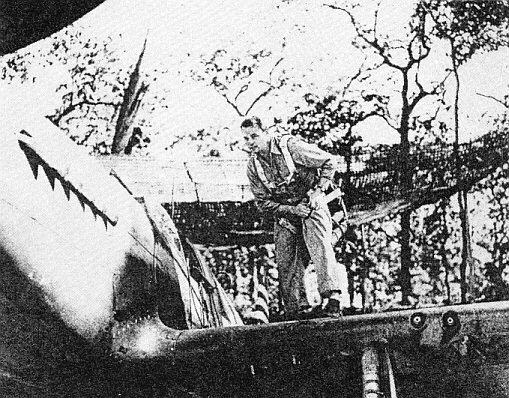 British Maj. Gen. Orde Charles Wingate's forces and the U.S. First Air Commandos delivered a lightning counterblow at the Jap rear in Burma. Gliders and planes flew in engineers, troops, supplies, mules, bulldozers - in fact, everything needed, landing them in a jungle clearing called "Broadway." In 1944 General Wingate wished to lead another expedition into Burma on a larger scale. Previously he had had to leave some of his sick and wounded behind his swiftly moving columns, but in 1944 he wanted to fly all of them to safety. We promised we would do that - and more. We visualized an Air Commando Force, the first in military history. Large numbers of Allied ground troops would be conveyed by aircraft deep into Burma and, once there, they would be wholly supplied by air. General Wingate believed that, while the Japanese were excellent jungle fighters, well-trained Allied troops could defeat them at their own game, provided they were mobile, in sufficient force, and exploited the military value of surprise. We would not only evacuate all wounded by air; we would also replace them with fresh combat troops. Furthermore, none of the soldiers would have to make long marches through tough jungle to get inside Burma. They could start fighting in top physical condition. In the same project, the AAF would gain airbases from which we could fight the Japanese at closer quarters and relieve the threat to our aerial life line to China over the Hump. Obviously, the men to lead this unprecedented project had to be aggressive, imaginative, and endowed with organizational talent of a high order. The Original of "Terry and the Pirates"
To AAF headquarters in Washington came two young men who were strongly recommended. One was a 34-year-old fighter pilot who had shown remarkable leadership in North Africa, Col. Philip G. Cochran, of Erie, Pennsylvania. In my office Cochran still wore his Natal leather boots with the trouser tops stuffed in. In North Africa he had originally headed a unit of replacement pilots, but before anyone was aware of it he had them up at the front fighting as a unit. Later he commanded a squadron of fighter pilots who were frequently so far ahead of our other forces that it was humorously remarked that they were fighting a war of their own. At the time, I did not know Cochran was the original of the character Flip Corklin in the comic strip "Terry and the Pirates," but he sounded like a good man for the job. The other man was Col. John R. Alison, who had been an outstanding fighter pilot with the 14th Air Force in China and had also fought the enemy from England, Russia, and the Middle East. He was short, slender, and self-possessed. He knew his business. I told both of them that they were going to Burma. Cochran immediately protested that he wanted to go "where there was some fighting." I informed him that he would get all the combat he wanted. I explained the unprecedented mission and ordered them to carry it out. "To hell with the paper work," I added. "Go out and fight." Perhaps my last words constituted a personal whim, for systematic organization work is necessary in modern war, and I knew they could do it. Cochran, as commander, and Alison, as deputy, established their first headquarters in a Washington, D.C., hotel in August 1943. Their initial task was to select men to help them. They then flew to England to coordinate plans with the British. General Wingate was enthusiastic and said heartily, "We are going in this to stay." The adventures of the popular comic-strip character in 'Terry and the Pirates" are based on the real-life exploits of the leader of the First Air Commandos. Here at his India base headquarters, he buckles on his parachute before taking off for Burma. One of the war's most brilliant and likable air officers, the 34-year-old colonel came to General Arnold's attention as commander of a fighter squadron in Tunisia. The aircraft Cochran and Alison selected for the mission were: transports and gliders to move troops, equipment, and supplies; light liaison, or "grasshopper-type" planes to evacuate the wounded; fighters; and medium bombers. The glider pilots were selected volunteers. Liaison-plane pilots were chosen for ability to repair as well as fly ships. An exhaustive training program was begun in America and concluded in India. Everything to be transported by glider was loaded and unloaded endlessly. Army pack mules became accustomed to bamboo stalls in the gliders. Morale was high, and there was little paper work. The men said, simply, "If Phil or John says we can do it, then, by God, we do it!" Officers and men, hot, dusty, and bearded, line up together at the chow lines, ate quickly, and went back to work. They sweated shoulder to shoulder unloading freight cars. For security reasons native help was kept to a minimum. At one base the headquarters was a bamboo hut, and the men slept at night on hard char-poys, or native cots. At first, some cooperating Allied units were not sure that the AAF could do what it promised; so Cochran and Alison put on demonstrations and proved their points. At one base, until it could get equipment, Cochran's photographic section developed its photos at night, using water from a near-by well and posting a sentry so that no wandering jeep's headlights would spoil the print. The Gurkha troops had never seen gliders before. They went through their training doggedly, but finally said, "We aren't afraid to go; we aren't afraid to fight. But we thought we ought to tell you -those 'planes' don't have any motors!" 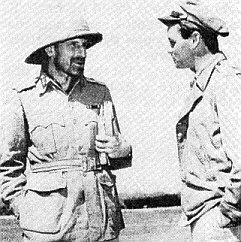 Called the "second Lawrence," the late Major General Wingate cleared Axis-backed Arabs in 1936 from British pipe lines in Palestine. He entered Addis Alaba, Ethiopia, at Emperor Haile Sclassie's side in 1941. Cochran's Air Commandos made his 1944 airborne invasion of Burma possible. The C-47 transports would tow the heavy gliders carrying General Wingate's troops and equipment to the areas he had selected in north-central Burma. He would indicate the areas; the AAF would pick specific places where our gliders could land. The first troops to land would guard the fields while Airborne Engineers built an airstrip with airborne bulldozers, scrapers, and other engineering equipment. C-47 transports could then land with antiaircraft guns and other field equipment, so that any Japs attacking in force could be held off. Our fighter planes could also use the field for aerial patrol and offensive operations. By evening of the first day nearly 100 C-47s landed with thousands of troops. This end of the field needed little leveling, but the other was badly rutted. Glider-landed bulldozer and carryall in background easily filled big holes. Cooperating with the AAF in this project were a British Army unit under Lt. Gen. W. J. Slim, the Indian forces under General Wingate, the tactical air force under Air Marshal Sir John Baldwin, and the Troop Carrier Command under Brig. Gen. William D. Old, of the U.S. Army. At the time, Lt. Gen. Joseph W. Stilwell was pushing down in northern Burma with Chinese-American forces. The Japs were threatening our airbases in India, just over the Burma border to the west. The Chinese were holding mountain positions against the Japanese in east Burma. If General Wingate could establish his men behind the Japanese in north-central Burma and cut their various supply lines, the Japs would be put in a difficult position regarding Allied attacks on three of their Burma fronts. Carrying enough ammunition and rations for several days, these Tommies were well fortified against Japs and hunger in case the glider cast off before reaching its objective. 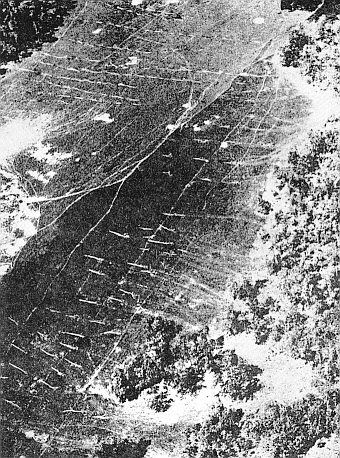 Several craft made forced landings, obliging soldiers to fight through jungle to the new airstrip. Rough air over the mountains caused towlines to foul. In February, 1944, the fighting began. Fighters and medium bombers flew into Jap-held Burma, blowing up bridges, destroying warehouses, supply centers, and supply trains. The Japs had been repeatedly bombed and strafed. The weather was suitable. But on D Day Colonel Cochran, on a hunch, ordered a last-minute photo-reconnaissance of Broadway and Piccadilly to make sure that both fields were clear. The year before, a C-47 had made a landing at Piccadilly to pick up some of Wingate's wounded; so the Japs might expect landings there. Their espionage must have warned them that something was up. Transports, gliders, pilots, troops - all were ready for the great adventure of March 5, 1944. The first take-off was set for 5:40 p.m. At 5:15 the last-minute photos of Broadway and Piccadilly were rushed from the laboratory. Cochran's hunch was been a good one. The Japs had dragged huge tree trunks all over the open space at Piccadilly and very possibly had mined it as well! No glider could possibly land. However, Broadway was clear, and although the Japs might purposely have left it that way to draw us into an ambush, it was decided to land all gliders at Broadway. D Day would stand. The first C-47 took off at 6:12 p.m., towing two heavily loaded heavy gliders. Others followed. From a green tea-garden valley they rose in wide sweeping circles to gain altitude, for they had to cross a range of 7,200-foot mountain peaks. 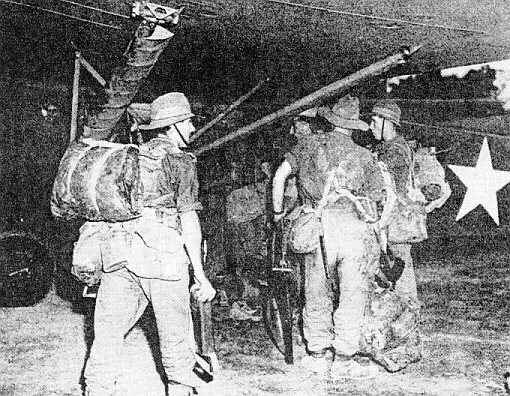 The gliders carried cargoes of resolute men, armed with Tommy guns, carbines, rifles, pistols, and hand grenades. The men knew that, because of the distance and the heavy loads, the gliders would have to land at Broadway. They could not be towed home, even if the Japs disrupted our plans. There was not turning back. The sun was going down, and its golden tints were gradually swallowed up in the jungle haze below. The men settled down in cramped positions for the 200-mile flight to their destination - and their fate. As Cochran had told his men, 'Tonight you are going to find out if you've got a soul. Nothing you've ever done, or nothing you are going to do counts now. Only the next few hours. Good luck." Some of the gliders held heavy bulldozers, tractors, jeeps, and pack mules. Most of the mules rode calmly enough, except one which kicked a hole in the side of his glider at an altitude of 8,000 feet. This must have been the highest mule kick every recorded! But to the muleteers it was no joke. As the gliders crossed the Burma frontier the moon came out, but there was too much air turbulence over the mountains for the men to appreciate it. Some of the heavily loaded gliders were in trouble because of the rough air. The night had to be clear for the operation; the moonlight would reveal the aircraft to any Jap fighters who might be waiting for them. There was an enemy airfield close by. The pilots and passengers anxiously searched the sky, but no Japs appeared. As they neared their destination, each man checked his firearms. They were now over Broadway; it was time to cut loose. Colonel Alison was one of the first to land. He was signaled in by the crew of the pathfinder which landed under the hand of Maj. William H. Taylor. The big craft came down out of the darkness to the jungle glade that was Broadway. Sailing 400 feet behind a Douglas Skytrain (C-47), the glider ferries reinforcements for General Wingate's columns far behind enemy lines. At 8,000 feet it easily crosses the Chin Hills, which form a natural barrier between Allies and Japs. Question mark on tail is the unofficial squadron insignia. Unfortunately, the field had numerous ruts and holes covered with high grass which had not shown up in aerial photographs. Teakwood had once been cut in the neighborhood, and the logs had been dragged by elephants over the ground when it was wet and soft. Some of the gliders had their undercarriages torn off and landed hard on their skids. Some were wrecked. As soon as possible, a new landing strip was marked out with flare pots to avoid the crashed gliders. Landing a glider at night under ideal conditions is difficult, but here conditions were at their worst. The first ground troops to land immediately fanned out to scout Japanese opposition. Photographs had showed that there were two places where the Japanese might mount machine guns. The first glider crews to hit the dirt went on the dead run to these two points -but no enemy machine guns were there. A green flare was sent up to indicate to gliders still in the air that the first ones to land were not being fired on. There was no opposition. We had taken the Japs completely by surprise! A second wave of gliders, on their way to Broadway, were recalled to their bases by radio. With no opposition, they were not needed immediately. One glider in the first wave, which contained a bulldozer, missed the landing area and slashed off both of its wings between two trees. The bulldozer had been lashed in the glider so that its first forward movement would lift the nose of the glider. It was a happy thought, for the bulldozer, torn loose from its fittings, kept right on going. It threw the glider nose up, pitching the pilot and copilot into the air. They landed unharmed, save for a broken thumb. Three undamaged bulldozers were enough to start building, with the first morning light, an airstrip on which our C-47 transports could land later with more troops and antiaircraft guns. The Japs might attack any minute. That first morning there was a burial of the 23 men who had been killed in glider crashes. A Burmese chaplain read the service, while overhead circled Allied planes, alert for any Zeros. The Airborne Engineers filled in Broadway's holes and ruts and leveled the humps. By evening the airfield was ready, and nearly a hundred C-47 transports of the Troop Carrier Command flew in and landed with thousands of armed men, enough to stand off any force the Japs could bring to bear upon them in that area. In any large military operation there are bound to be mishaps. 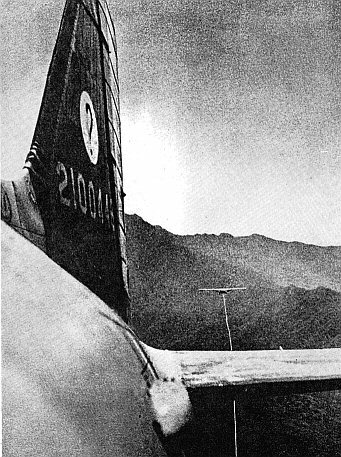 A few gliders were released before they reached Broadway because of their heavy loads, air turbulence over the mountains, or the poor visibility met in descending. Some landed in friendly territory. Most of the crews landing in enemy territory escaped to safety. One medical officer, a glider pilot, and co-pilot, with 15 native troops, walked 85 miles to Broadway in ten days. Out of food at one point, they tossed a hand grenade into a pond and killed 60 fish. There was a soldier hero in one crew whose men were crossing a river in Jap-held territory. This man drowned rather than call for help and thus endanger the lives of his friends. The plan for flying out the wounded in light liaison planes worked out as scheduled. To elude the Japs, they flew at treetop height, under the noses of enemy antiaircraft. A man could be wounded behind enemy lines in Burma during the day and be resting in a hospital in India that night. All troops received equal care: British, Gurkhas, Burmese, Yanks, West Africans, and Indian soldiers. Last-minute reconnaissance of the two fields showed Piccadilly unusable for glider landings. As Broadway was untouched, the whole force landed there, completely surprising the enemy. The names were suggested by the British-United States joint operation. During the weeks of preliminary bombing, planes deliberately avoided these clearings to allay Jap suspicion. The Japanese did not realize what was up for a whole week, or could do nothing about it, and the gliders that made forced landings before they reached their destination added to the Japs' confusion. During the first six days, thousands of Allied troops, 175 ponies, over 1,000 mules, and 500,000 pounds of supplies were brought in by air. On the eighth day the Japs discovered the field. Twenty Japanese aircraft came over, but our detection apparatus warned us they were coming and we were ready. Four Japanese planes were shot down by fighters, and one was destroyed by our antiaircraft. The Air Commando Force discovered that the Japanese were bringing more airplanes into Burma. Twenty P-51 Mustangs promptly raided enemy airfields and destroyed 34 planes, with a loss of two. 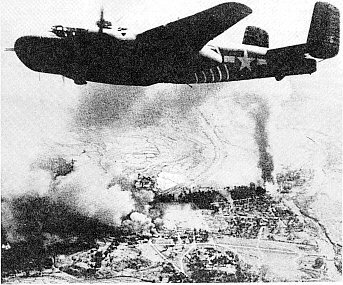 The same day nine of our B-25 medium bombers destroyed twelve more Japanese planes on the ground. The Japanese came over and shot up two or three Allied fighters at Broadway but did no real damage. Since that time the Japs have attacked Broadway repeatedly, but have hindered our operations on or from it only slightly. A subsidiary airfield to relieve the congestionat Broadway was built nearby and named "Chowringhee," after Calcutta's main street. After it had served its purposes, Chowringhee was abandoned. The next day the Japanese bombed it. In addition to establishing Broadway and other behind-the-line fields, the First Air Commando unit carried on the air side of Win-gate's operations. A special task was to parachute needed equipment for river crossings to columns on the march. In one such drop the Americans added precious cigarettes and extra food with a note saying that they "wanted to do more than lip service" for their Allies. The British commander thanked them and apologized that he had no typewriter in the jungle to phrase a formal reply. B-25 medium bombers aided Wingate's ground forces by dropping parachute fragmentation bombs on enemy troops and working out unique techniques for supporting ground troops in this theater. Asked by the ground forces to break a telephone line between two Jap-held towns, a P-51 did so by diving through the wire at five different places. However, most operations were more extensive. On one occasion a British unit was on a hill two miles from a Japanese-held town. The enemy had machine guns and fields guns and was using them very effectively. The British called for air support. The British would indicate with smoke the targets they wanted bombed, and then tell our bombers and fighters in the air just where the target was in reference to that smoke. The bombers worked from low levels without bomb sights. The fighters would follow, and dive-bomb. Ground Forces: "Do you see that building with the red roof in the center of the town?" Air: "Yes, we see it." Ground: "Will you get it for us?" The B-25, or fighter-bomber, would either bomb the building or hit it with 75-mm cannon. The Japanese nest destroyed, the Allied forces would go on to the next, until the town was stormed and captured. At this writing, it is too early to estimate the military significance of this operation, except to say that its successful execution gave a terrific lift to all Allied operations in the China-Burma-India Theater. Many lessons were learned that will be valuable in the future. The able General Wingate was killed in March of this year in an airplane crash but his good work continues. At this writing, we have aerial superiority in this part of Burma. By proper use of air power, the Japanese are denied freedom of movement. Every day by air, Allied troops are being supplied by the Troop Carrier Command with food, ammunition, and replacements. Our Japanese railroad line has been severed, and two main lines of supply cut off. The Japs now operate small supply boats on the Ir-rawaddy and Chindwin Rivers at night and hide them from our fighter planes by day. They do the same with their motor trucks on the roads. That the mission was carried out despite many uncertainties and obstacles is a tribute to the cooperation of all British and American units taking part in it. Colonels Cochran and Alison carried out their orders: they went to Burma to fight, and did not concentrate on the paper work that some officers confuse with winning a campaign. A statistician assigned to them at a later date was reported to be on the verge of despair. It would appear clear that new weapons of war have not lessened the value of personal leadership: indeed, science had increased the effectiveness of the imaginative military man and made his operations more decisive. In training school they would have been "washed out" for circling low over the field before landing, but in the field, regulations and rank are minimized. These swift planes were Wingate's artillery. They blasted paths for ground troops, strafed enemy columns, and provided air cover against Zeros. They shot down Jap planes at a ratio of ten to one, getting 34 in one day.